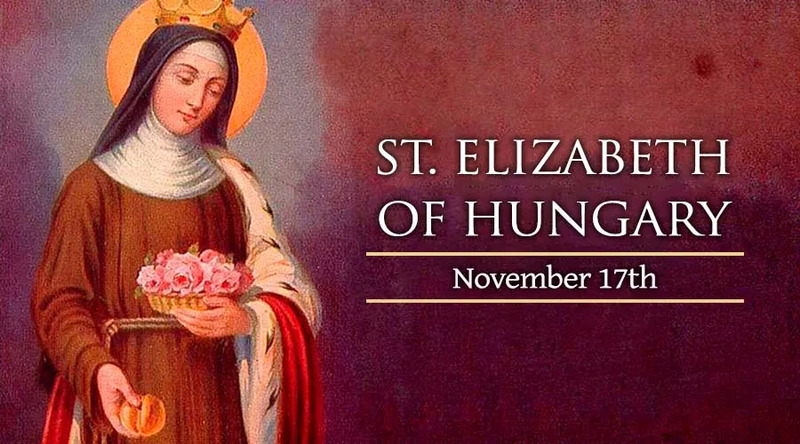 On Nov. 17, the Catholic Church celebrates the life and example of St. Elizabeth of Hungary, a medieval noblewoman who responded to personal tragedy by embracing St. Francis' ideals of poverty and service. A patron of secular Franciscans, she is especially beloved to Germans, as well as the faithful of her native Hungary. As the daughter of the Hungarian King Andrew II, Elizabeth had the responsibilities of royalty thrust upon her almost as soon as her short life began in 1207. While she was still very young, Elizabeth's father arranged for her to be married to a German nobleman, Ludwig of Thuringia. The plan forced Elizabeth to separate from her parents while still a child. Adding to this sorrow was the murder of Elizabeth's mother Gertrude in 1213, which history ascribes to a conflict between her own German people and the Hungarian nobles. Elizabeth took a solemn view of life and death from that point on, and found consolation in prayer. Both tendencies drew some ire from her royal peers. For a time, beginning in 1221, she was happily married. Ludwig, who had advanced to become one of the rulers of Thuringia, supported Elizabeth's efforts to live out the principles of the Gospel even within the royal court. She met with friars of the nascent Franciscan order during its founder's own lifetime, resolving to use her position as queen to advance their mission of charity. Remarkably, Ludwig agreed with his wife's resolution, and the politically powerful couple embraced a life of remarkable generosity toward the poor. They had three children, two of whom went on to live as as members of the nobility, although one of them –her only son– died relatively young. The third eventually entered religious life and became abbess of a German convent. In 1226, while Ludwig was attending to political affairs in Italy, Elizabeth took charge of distributing aid to victims of disease and flooding that struck Thuringia. She took charge of caring for the afflicted, even when this required giving up the royal family's own clothes and goods. Elizabeth arranged for a hospital to be built, and is said to have provided for the needs of nearly a thousand desperately poor people on a daily basis. The next year, however, would put Elizabeth's faith to the test. Her husband had promised to assist the Holy Roman Emperor Frederick II in the Sixth Crusade, but he died of illness en route to Jerusalem. Devastated by Ludwig's death, Elizabeth vowed never to remarry. Her children were sent away, and relatives heavily pressured her to break the vow. Undeterred, Elizabeth used her remaining money to build another hospital, where she personally attended to the sick almost constantly. Sending away her servants, she joined the Third Order of St. Francis, seeking to emulate the example of its founder as closely as her responsibilities would allow. Near the end of her life, she lived in a small hut and spun her own clothes. Working continually with the severely ill, Elizabeth became sick herself, dying of illness in November of 1231. After she died, miraculous healings soon began to occur at her grave near the hospital, and she was declared a saint only four years later. Pope Benedict XVI has praised her as a “model for those in authority,” noting the continuity between her personal love for God, and her public work on behalf of the poor and sick. Patronage: Bakers; beggars; brides; charitable societies; charitable workers; charities; countesses; death of children; exiles; falsely accused people; hoboes; homeless people; hospitals; in-law problems; lacemakers; lace workers; nursing homes; nursing services; people in exile; people ridiculed for their piety; Sisters of Mercy; tertiaries; Teutonic Knights; toothache; tramps; widows. Representation: A queen distributing alms; woman wearing a crown and tending to beggars; woman wearing a crown, carrying a load of roses in her apron or mantle.